Kumara Vidugalage Dona Geetha Samanmalee Kumarasingha popularly known as Geetha Kumarasinghe is in the eye of a politico-legal storm. 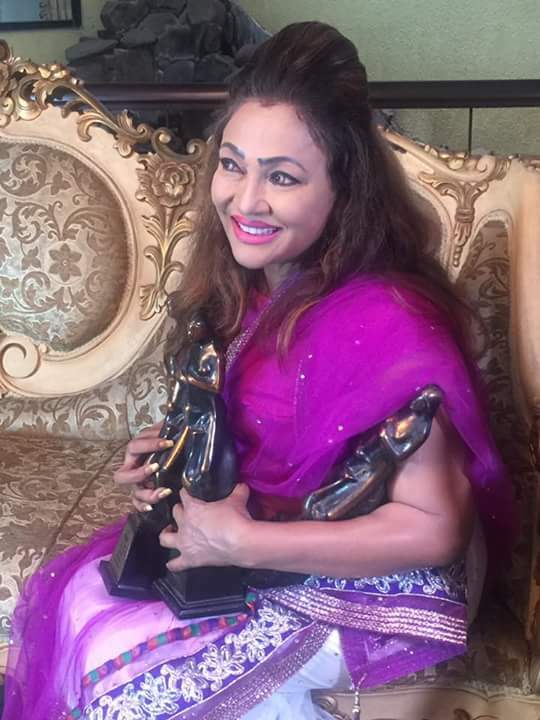 The glamorous actress turned politician who was elected to Parliament in August 2015 from the Galle district on the United Peoples Freedom Alliance(UPFA) ticket has been unseated by an Appeal court ruling. The post – 19th Amendment constitutional position regarding dual citizens right to contest elections was firmly established by the Court of Appeal on May 3, when it unseated Galle district MP, Geetha Kumarasinghe, for failing to negate her dual citizen status by renouncing her Swiss nationality before she contested for parliament in August 2015. Court held that under the 19th Amendment to the Constitution, a dual citizen is not eligible to contest for Parliamentary membership and therefore ms.Kumarasinghe could no longer function as a Parliamentarian. The bench comprised Justice Vijith Malalgoda the President of the court of appeal and Justice Preethi Padman Surasena.Justice Preethi Padman Surasena with Justice Vijith Malalgoda concurring also directed the State to recover costs from ms.Kumarasinghe for each day she sat in Parliament knowing that she was a dual citizen and being disqualified to be a Member of Parliament. According to newspaper reports , Deputy Solicitor General Janak de Silva making submissions to Court based on recommendations from the Attorney General stated that Kumarasinghe possessed citizenship in Switzerland at the time that nominations were called for the last Parliamentary election here.The DSG told Court that Kumarasinghe could not lay claim to any privileges provided to MPs when she continued in the capacity of an MP while holding dual citizenship status, because this construed a direct violation of Clause 91 (1) of the Constitution of Sri Lanka.De Silva told Court that though the respondent had claimed in the recent past that she had given up her dual citizenship, she had failed to sustain that statement with either written documentary proof or otherwise.He further told Court that despite the Controller of Emigration and Immigration having directed her officially, in writing, to furnish the necessary documents based on advice received from the AG, Kumarasinghe had failed to respond to date. This too, he said, was a direct violation of the Elections Act as well. The dual citizenship issue arose when five voters of the Galle District filed a petition in the Court of Appeal requesting Court to declare Ms.Kumarasinghe ineligible to remain as a Parliamentarian while holding dual citizenship.Petitioners in their Writ application challenged her appointment and/or election as the Member of Parliament.The Petitioners were W.W.E. Buweneka, J.K. Amarawardhana, A.C. Gunasekera, J.K. Wijesinghe and Prasanna Deepthilal from Galle electoral district.. They cited Geetha Sammanmalee Kumarasinghe, Controller of Immigration and Emigration, UPFA Secretary Prof. Wishwa Warnapala (now deceased) and the Secretary General of Parliament as Respondents. The unseated MP however is not ready to take her disqualification lying down and is determined to seek recourse by appealing to the Supreme court. In a bid to hold off Piyasena Gamage from filling the vacant MP slot, the disqualified Parliamentarian met with the Speaker, Parliament Secretaary-General and Commissioner of Elections and informed them that she was moving the Supreme court in this matter. An appeal would be lodged early next week. Geetha said that she was hopeful of gaining a reprieve from the Apex tribunal in the matter and would be able to retain her parliamentary membership. As such she requested that the MP vacancy should not be filled until the Supreme court ruled on her envisaged appeal. It is very likely that Parliament and the Elections Dept would be guided by the Attorney – General’s advice in this regard. Geetha herself has accused Pitasena Gamage of being the architect of her downfall. In an interview to the “Ceylon Today”newspaper she has said that the four persons who petitioned against her were Piyasena Gamage’s agents or accomplices. Geetha stated ” One is the brother-in-law of the defeated minister. Another one is the person who was doing the minister’s contracts. Third owns a quarry which has a legal problem. The minister has promised him to resolve it. The fourth is a person who has worked in cooperatives. He was the arch rival of Piyasena in the past but now is a close friends”. Geetha also insinuated that she had been offered a deputy ministership by this Govt and that she was told her “case” would be taken care of. She had refused to join the Govt. What Geetha seemed to imply was that she was in this predicament only because she refused to play ball with the current regime. Geetha also alleged that Men were trying to pul her down because she was the only Woman MP elected from the Southern province. She also charged that there were some Dual citizen MP”s in the current parliament including a minister. The political fall-out of the Geetha Kumarasinghe unseating issue is interesting. The Sri Lanka Freedom Party(SLFP) continues to propagate the myth that it is a united political party. The reality is that the SLFP or at least SLFP parliamentarians are deeply divided into two groups. One is aligned with President Maithripala Sirisena and the other is loyal to ex – president Mahinda Rajapaksa. Geetha Kumarasinghe has remained a Rajapaksa loyalist to date. As a result she was removed as Bentara – Elpitiya electoral district organizer by the party leadership sometime ago. Though the bulk of the SLFP rank and file are with the de facto leader Mahinda Rajapaksa, the administrative machinery of the party is under the control of the de jure SLFP leader Maithripala Sirisena. PIyasena Gamage belongs to the Sirisena camp. Therefore if Geetha is replaced by Gamage then the joint opposition would lose one MP and the Govt faction could gain one parliamentarian. Against that backdrop the UPFA Group of MP’s known as the “Joint Opposition” would certainly politicise the Geetha Kumarasinghe issue at a wider level. Already former cabinet minister Bandula Gunawardena has raised the issue of Singapore citizen and former Central Bank Governor Arjuna Mahendran’s signature being on currency notes. The rhetorical question asked by Bandula is why a dual citizen like Geetha is disqualified to be an MP while an ex – Sri Lankan citizen now a Singaporean citizen was permitted to sign currency notes. More important perhaps are the underlying political implications of the dual citizenship controversy. Prior to the 19th Constitutional Amendment being enacted it was possible for people with dual citizenship to contest elections in Sri Lanka. When the Sirisena-Wickremesinghe Govt. replaced the Rajapaksa regime in January 2015 , many of the bottlenecks surrounding the obtaining of dual citizenship by Sri Lankan expatriates were removed. Despite these “dual citizenship friendly” actions, the new regime introduced a problematic provision in the 19th Constitutional Amendment debarring dual citizens from contesting elections in Sri Lanka. It was widely believed then that the provision was a pre-emptive move to prevent ex-President Rajapaksa’s siblings Basil and Gotabhaya from seeking electoral office.Both hold US citizenship.Some analysts feel the tsrget was Gota more than Basil. Former Defence and Urban development secretary Gotabhaya Rajapaksa is a controversial personality who is loved by some and hated by others. There is a school of thought in Sri Lanka which is optimistic that Gotabhaya Rajapaksa is destined to rule the country in the future just as his elder brother did. The 19th amendment has reversed the 18th amendment and blocked Mahinda Rajapaksa from contesting for the presidency again. If the envisaged new constitution materialises and the executive presidency is abolished and the Prime ministerial office is empowered then Mahinda Rajapaksa can or may seek Prime ministerial office. If however the diluted executive presidency continues to remain then the ex-president cannot contest the presidential poll and an alternative to Mahinda has to be found. Many think the ideal alternative is Gotabhaya. In recent times the Gotabhaya fan club has been working overtime promoting the retired Army Colonel as the prospective presidential candidate. This “push” has now suffered a temporary setback. Gotabhaya Rajapaksa is a dual citizen holding US citizenship. His only son is well-settled in the US. 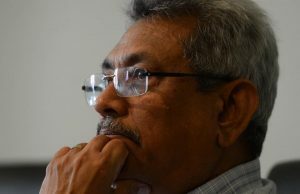 If Gota is to contest the presidential or parliamentary poll in the future he would have to give up his US citizenship. In spite of critically denouncing the US at times, Gotabhaya has not shown any inclination to renounce his US citizenship. Even recently when Gota addressed the Foreign Correspondents Association in Colombo the ex -defence secretary was non committal about renouncing US citizenship and entering active politics. Mahinda too has not been too enthusiastic about Gota contesting polls. Hence the 19th amendment clause is viewed as a pre-emptive strike by the ruling Govt.In any case the Appeal court ruling on Geetha Kumarasinghe has demonstrated that if Gotabhaya Rajapaksa wants to be elected to high office then he has to clearly and unequivocally renounce US citizenship. Those in the Sirisena – Wickremesinghe – Kumaratunga camp opine that Gota would never give up his US citizenship. Hence the provision in the 19th amendment was an anticipatory stratagem aimed at keeping Gota out of Parliament and the President’s House. It was based on the premise that Gotabhaya would never opt to lose his dual citizenship status.It remains to be seen whether this calculation is correct or not. After Geetha was unseated , Basil Rajapaksa confirmed to newspapers that he was a dual citizen and that his family was in the US. He had no intention of renouncing US citizenship stated Basil. Gotabhaya is yet to speak to the press after Geetha’s disqualification. 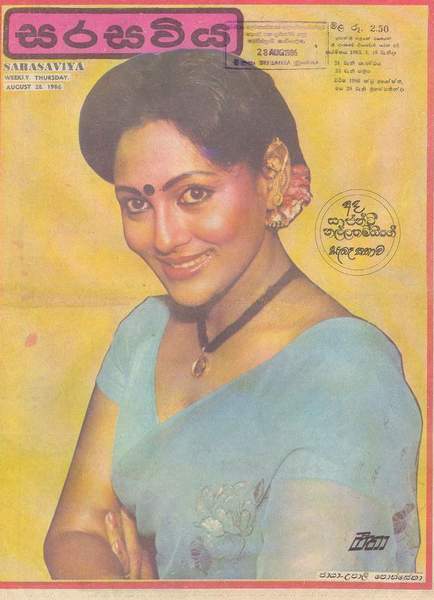 Geetha Samanmalee Kumarasinghe was born on 5 July 1955 in Badulla. Her father Wijaya Kumarasinghe was from Hamburugala in Bentara. Her mother Udulawathi Siriwardena was from Kotmale. Though Geetha, the eldest, was born in Badulla, she and her seven younger siblings grew up in southern Bentara. 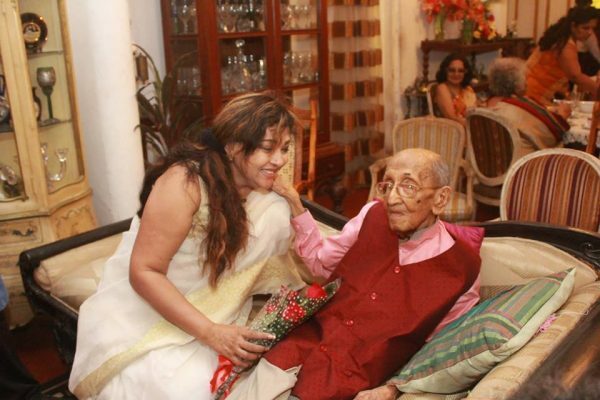 Her father Wijaya was a journalist who worked as the Deputy Editor of the journal Sinhala Bauddaya (Sinhala Buddhist). The children had a strict upbringing and were not even permitted to see movies. The lovely lass from the south who won a beauty contest and broke into films has come a long way. 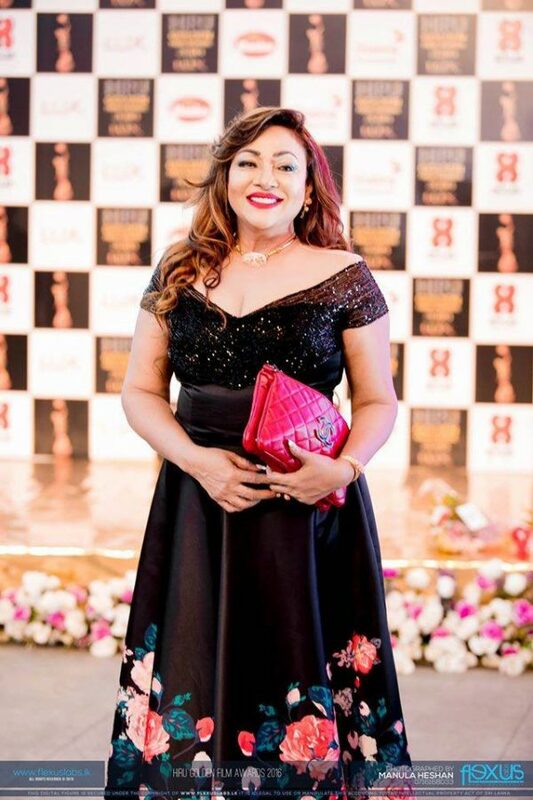 The dazzling damsel who sizzled on screen reached new heights by being elected as an honourable Member of Parliament from the Southern Province. Now she is engaged in a last ditch battle to retain her Parliamentary seat. Geetha who has played many screen roles of an opporessed woman fighting against injustice is now fighting in real life against what she perceives as an injstice against her. Her numerous fans and well-wishers would hope that Geetha Samanmalee Kumarasinghe would face up well to this challenge.